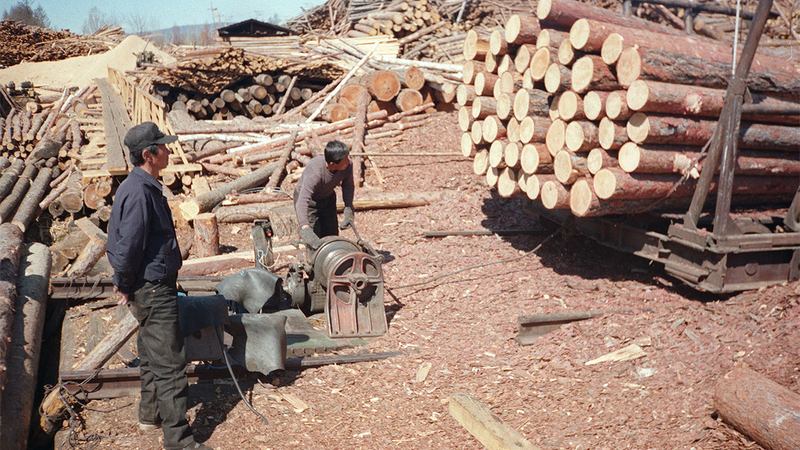 North Korean workers work at a saw-mill in the camp of Dzhalingra in the Russian Far East in a file photo. A once populous North Korean migrant community in Vladivostok, Russia now faces an uncertain future as Russia makes efforts to comply with U.N. sanctions on North Korea. With the deadline only one year away, Russia has begun to deport North Korean workers, sources say. An employee of a local travel agency confirmed the apparent drop in numbers. “A Russian friend of mine manages a construction site. I asked him why it takes so long to finish construction projects and he said all the North Korean [workers] have left,” the travel agent said. “There is an international [passenger] terminal, and ships have come to pick up North Korean [workers] a number of times,” the agent added. A North Korean worker said that the Russian government is cracking down on North Koreans and kicking them out of the country. “[The government] has ordered that we are to be removed and [for companies] to not give us jobs,” the worker said. “The international community was trying to figure out how North Korea is getting money to make nuclear weapons, and they found that there are many North Korean workers in Russia, so that’s why we’re being kicked out.” the worker added. Some North Koreans remain, even though their presence may fall into a legal gray area. “If they get caught they will be deported,” he said. “Since I can’t work on that visa, if the police catch me I’ll have to fork over 100,000 rubles [about $1500],” he said. Park’s travel visa is valid for only three months. He currently works for a local construction company, installing tiles over plaster. “I have to offer part of the money I earn to my country. I have to pay 15,000 rubles [$220] every Saturday,” said Park. “I seriously work a lot, like 18 hours per day! I’m usually there from 7 a.m. until 11 p.m. or midnight. Sometimes I’ll work until 3 a.m. the next morning!” he said. Park said he had been working in several Russian cities for about three years before returning to North Korea. He then came back to Russia for work this year. “I was not able to return home for three years. [This time] I can’t go back before making enough money,” he said. “I plan to make lots of money but my government takes its cut, and I have to eat, so there’s not much left from what I’ve earned,” Park explained. Other workers have it worse, he said. “People who work as a group make only about $100 per month. If they buy cigarettes or a pair of socks, they’ll have nothing left,” he said. Park’s biggest complaint was that the questionable legality of working in Russia leaves him vulnerable, and that North Korean middlemen are taking advantage of him. “I only need to give $200 [per month] to the country,” Park said. “The problem is our management. I usually can make like 3,000 rubles [about U.S. $45] per day. Some days I can make as much as 20,000 rubles [about U.S. $300]. But the president and vice-president of the [North Korean] labor management company extort money, and that much cash never actually reaches my hands,” he said. Yet with all the hardships Park faces in Russia, he still feels he is more free than his countrymen who he left behind in North Korea. Park, who speaks both English and Russian was envious of his brethren in the South. “South Koreans can go anywhere they want, How nice is that?” he said.